I truly believe what I said the other day about ankle pants being a casual chic girl's best friend. I didn't want to just wear jeans and I didn't want to commit to trousers (and none of them like me right now anyway). Ankle pants are the perfect in-between. Actually, I could have worn black trousers now that I look at these pictures, and I would have loved it. 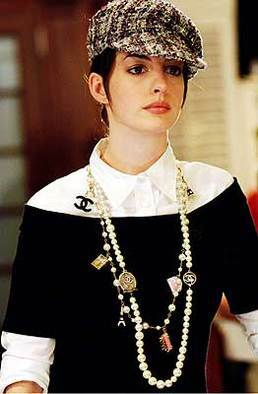 This particular outfit is inspired by one of my favorite Anne Hathaway ensembles from Devil Wears Prada. I can't find a full size screen shot that shows her own long wide-legged bottoms, but a picture of the top half of the outfit might give you enough of an idea of the look I was going for. I simply adore the buttoned collar under the bateau neckline, layered with chains. Menswear-meets-Audrey-Hepburn chic. I'd worn a version of this with a black sweater long ago, but I thought I'd pull this pretty baby blue sweater out of retirement to revisit it for spring, adding oranges and corals for pops of color. Of course, I have no Chanel in my closet, so a few long chains of lesser birth had to do. Incidentally, this is about the only way I'll consent to wearing a white button-up. I really want to try ankle pants! I always think I shouldn't because of my height. But I think that's a lie. If I find them in the right fit and crop them to the perfect place, I think it could work! LOVE this shade of powdery blue on you, too! I know this is totally random but I'd love to see the back of your hair when you wear it up like this. I never wear my hair up because I never like how it looks. I always look like a sloppy mess but this is so cute.